Is my bundle of code add-ons for the Flashable DSM ecus. 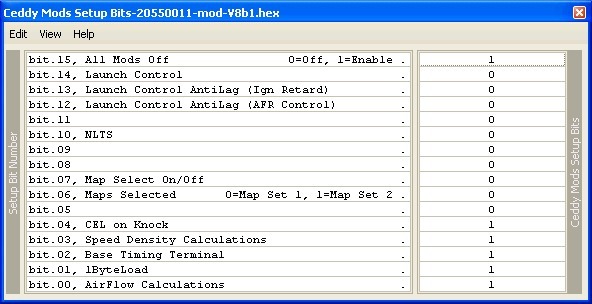 It adds features that are not present in the stock ecu like a StutterBox, NLTS, CEL on Knock, etc. If you have ever flashed an Evo and used TephraMods, you will find my Mods very similar. I have tried to use the same units as the Evo coders, when possible, so loggers and other tools will be compatible. An extra step I have taken is try to make everything more universal and compact. Trying to get all the definitions and patches together for Evo can be a hassle because they have multiple roms and patches and definitions for each rom. I have tried to remedy this by having one universal rom for the DSMs (20550011), and one definition with everything in it. And one group of Mods with all the patches in it. This allows you to download one .ZIP file, and have everything you need. Current Version is 1.9C beta. Note – Windows 7 and Vista have a feature called UAC. It makes a duplicate copy of your program files. To remedy this don’t install EvoScan and EcuFlash to C:\Program Files\, instead install to another directory created by you. For example install to, C:\ProgramsXP\. User Levels in EcuFlash are now taken advantage of. This allows someone just starting out to set the level to Beginner and only the few necessary maps are displayed. This reduces confusion from seeing 100+ maps for the first time, when you are going to use less then ten of them. Launch Control has four levels of functionality. Below the Rev Limit Switch Speed (7 mph), the Rev Limit is set to the Stationary Rev Limit (4500 rpms). Once AntiLag Start RPM (4000 rpms) is exceeded, Ignition Retard sets timing (-15*), and AFR Control adjusts fuel (9:1). Above the Rev Limit Switch Speed (7 mph), the Rev Limit is set to the Normal Rev Limit (7500 rpms). If the Clutch Switch is depressed, the Rev Limit is set to NLTS RPM (5500 rpms). Launch Control has a top down enable hierarchy. To use Ignition Retard, Launch Control must be enabled. 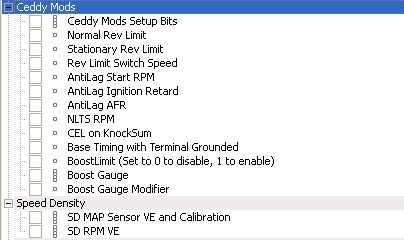 To use AFR Control, Ignition Retard must be enabled. To use NLTS, Launch Control must be enabled. To use NLTS, the Clutch Switch must be wired to ecu pin 91. The H8 DSMs have two sets of many of the maps. This is normally used for Automatics. In Park and Neutral the first set of maps is used. In Drive, 1st, 2nd, and Reverse the second set of maps is used. Map select allows you to lock a set of maps to always use. This allows you to have a set of maps for normal gas and a set for race gas and easily switch between them. CEL on Knock will light the CEL once a certain knock count is exceeded. If the CEL is already lit from an OBD code it will turn the CEL off. This gives you a quick indication when you are knocking. Base Timing Terminal adds the Base Timing Function like the 1Gs and 95-96s have. If not present, you must add a wire to ecu pin 52. When grounded, timing will be locked to 5* so you can properly align a 1G Adjustable CAS. The normal loggable Load maxes out at 160. One Byte Load raises this max to 320 while still having the speed of a one byte request. Future versions will have a adjustable multiplier. AirFlow Calculations add the ability to log air flow in lb/min or g/sec. Speed Density Calculations enable Volumetric Efficiency calculations, to help set your VE Tables while using your MAF. See Speed Density for more info.